Tropical Paradise with Great Access to the Gulf & Heated Pool! Newly Renovated 3/2 Waterfront, Pet Friendly Home, New Heated Pool! 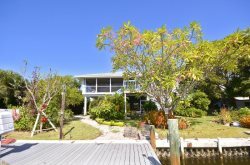 This immaculate 3 bedroom, 2 bathroom home is waterfront with Direct Access to the Intra-coastal Waterway, your gateway to the Gulf of Mexico, Sanibel, Captiva, and Cayo Costa. Not only is this newly renovated home beautiful inside and out, it is also Pet Friendly! Bring your boat for some of the most renowned fishing in the country. Relax in style on the air conditioned lanai or enjoy the beautiful weather on the patio. St James City has a ton to offer. There are several great restaurants and bars nearby, as well as kayak rentals. You are sure to have a fantastic time! This newly renovated 3 bedroom waterfront, pet friendly home with boat lift has everything you need for the perfect vacation. Whether you are trying to escape work, the cold, or just wanting to get away for a little fishing, this is the perfect vacation rental for you. New pool under construction, will be ready for season 2019! Call us today at (239) 283-0909 to book your stay in this tropical paradise home. • Boat lift, 8,000 lbs.